Well, going back, I was giddy and excited to watch it because I am a Liam Neeson fan (di lang halata) and because I’ve seen the previous films of the series. As far as I could remember, I saw the first one with my grandfather on a cable channel…that might explain my attachment to it. Plus, Liam is such a likeable actor and his role on the movie could just capture any daughter that loves his father very much. I am very amazed by how much Bryan Mills (Neeson) loves Kim (Maggie Grace) so much that he would do anything on his power and skills to save her from harm. The real action though started the moment Bryan was declared to be the primary suspect. Knowing he didn’t do it, he ran off and looked for evidence to prove that he is innocent. With the help of his friends, his superb skills, and the desire to his ex wife’s murderer, he set out to an action-filled, heart stopping, hold-on-to-your-seat scenes. And also, the whole duration of the movie, I can’t help but feel the enormous need to hug Liam Neeson. Teehee~~ I just want to give him a bear hug because of all of the things he’d gone through. I also noticed that he’s kinda having trouble running around na…might be because of his age. Mekek. Taken movies will always have special space in my heart, that is for sure. 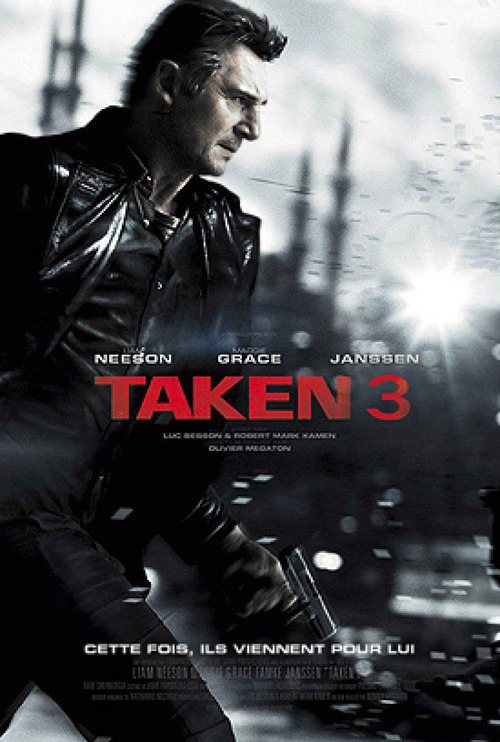 Watch Taken 3 to see how the trilogy will be concluded. It’s a must watch and worth every penny! Promise!